DNS Made Easy’s system monitoring and failover solutions were found to have saved clients over half a billion dollars in potentially lost revenue. (Reston, VA) — In a survey of DNS Made Easy clients, it was found that DNS Failover and system monitoring has saved clients over half a billion dollars in revenue over Q1 2016. DNS Failover is a configuration that allows traffic to be “failed over” from a user’s primary IP address to a backup IP address. The transition is seamless, with no appreciable effects to end-users. “DNS Failover isn’t just about failing over traffic to another IP. It becomes essentially useless without monitoring, because if the backup IP is also down, then your site is still downed,” says President of DNS Made Easy Steven Job. It has to be paired with system monitoring, which first checks to make sure that the backup IP is online and operational, and then keeps an eye on a user’s primary IP after traffic has been failed over. This means that as soon as the original IP is back online, traffic will be automatically failed back to the primary IP. Over one hundred DNS Made Easy clients were surveyed who had all been using failover. Clients were asked to share the average loss of revenue due to hosting downtime, based on experiences they’d had prior to implementing failover. Surveyed clients ranged from small businesses to large corporations, with larger companies claiming to have lost hundreds of thousands of dollars due to a single outage. We found that on average clients were losing $2,500 per hour during an outage. This number can vary, based on the amount of a traffic a site receives, however we based our averages on clients who claimed outages had the potential to lose them a thousand dollars an hour, to some that would lose the same over a day. This number also reflects the types of lost services from site availability to digital communications. DNS Made Easy was then able to extrapolate this number and apply it to the number of clients who used failover over the course of the first quarter. The numbers were astounding, as engineers found that cumulatively clients had saved $525 million in revenue. This number doesn’t even take into account the potential loss of revenue based on loss of customer trust and other potential long-term effects of an outage. The study also found that in Q1 2016, DNSME failover services acted in response to detected downed IP addresses more than 315,000 times. The associated downtimes varied from as little as a minute to over eight hours. In total, DNS Made Easy failover services were able to avoid 4,375 days of downtime. 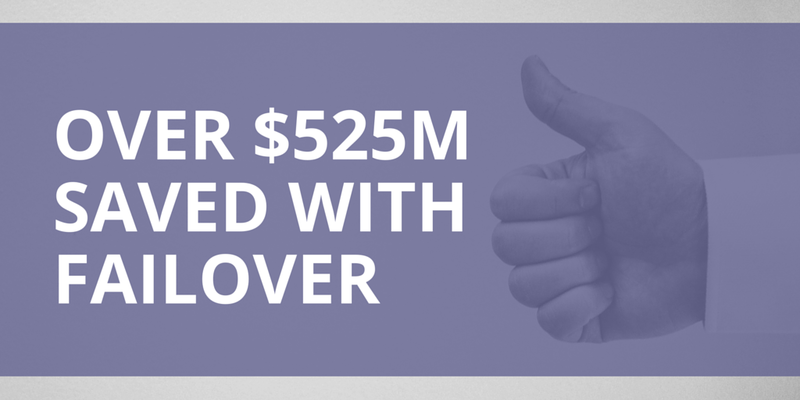 In the end, the engineers found that failover services saved clients an estimated $525 million dollars in potentially lost revenue. To put this in perspective, in a study of US data centers it was found that an unplanned data center outage could cost upwards of $7,900 per minute. This becomes astronomical when extrapolated to the length of an outage, which would cost 11 million dollars over the course of a day long outage. DNS Made Easy serves over 900,000 domains that range from ecommerce sites to online facing brands that use their site to communicate with clients. Regardless of industry, downtime can be extremely costly, and shouldn’t be overlooked. “Too many people think that managed DNS services are only for high risk industries like gaming or gambling sites, however outages effect all industries and companies regardless of size or riskiness of clientele,” says Job. Outages more commonly occur due to internal errors and configuration issues, rather than from attacks.